On July 13, 1982 the United States Postal Service (USPS) issued a postage stamp honoring Americas’s Libraries. 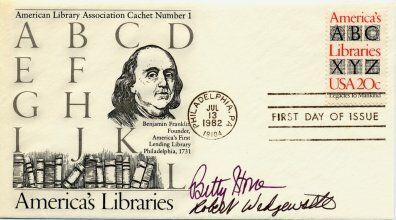 The first day of issue ceremony for the stamp took place in Philadelphia at the Philadelphia Civic Center in conjunction with the annual meeting of the American Library Association. Participants in the ceremony included ALA President Betty Stone, Keith Doms, Director of the Free Library of Philadelphia, and Jane F. Kennedy, General Manager of the Library Division of the USPS. It is common practice to create special first day covers (envelopes) for new postage stamps that are cancelled with a “First Day of Issue” postmark. These covers usually include a cachet (illustration) and are created by commercial companies, organizations, and individuals. The American Library Association created its own first day cover (see below) which it sold to ALA members and collectors of first day covers. The Washington Office of ALA also created a first day cover to celebrate the occasion. 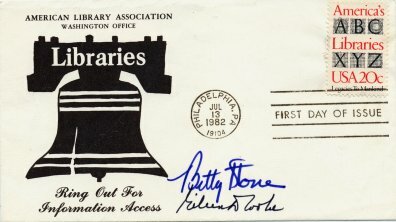 I’m a collector of first day covers for the 1982 America’s Libraries postage stamp, and I recently had the good fortune to receive as a gift one of the first day cover issued by the ALA Washington Office. Thank you Gail McGovern! The really neat thing about this cover which is shown above is that it is signed by Betty Stone, ALA President, and Eileen Cook, the Director of the ALA Washington Office. The cover includes an insert “An A B C For Dealing With Your Legislators”. 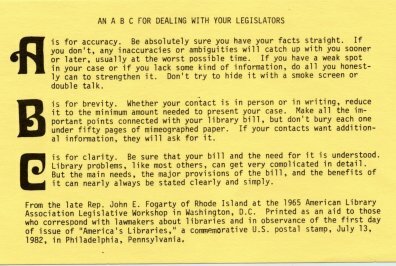 The content of the insert was created by Rep. John E. Fogarty of Rhode Island for an ALA Legislative Workshop in 1965. I wrote a previous post about Eileen Cooke and the other “Extraordinary Women of ALA’s Washington Office”. Where Have All the Reference Books Gone? Over the last several months, Gleeson Library patrons have noticed a decreasing number of books on the shelves surrounding the Reference Desk. Those shelves are now almost completely empty! This is due to work on the large-scale Reference Integration Project, which is incorporating all physical reference materials into the main stacks. The project began late last year and involves the collaborative efforts of three library departments: Reference, Cataloging, and Access Services. Reference staff pulled and tracked all materials from the collection. Cataloging staff is cleaning up and adjusting records to reflect the new stacks location. Access Services is interfiling the materials into the stacks and completing accommodative shifting as necessary. Currently cataloging is finishing up the last several carts of books. Access Services will continue interfiling and shifting this summer. Upon completion, roughly 12,000 volumes will have been updated and integrated into the stacks. The vast majority will be interfiled into the core collection of the main stacks. Reference folio atlases will join the other cartographic resources in the maps area on the Lower Level. Simply stated, this is a huge change! Especially for the librarians and patrons that are accustomed to the old location and who often refer to these materials. These reference books will be available to all, just in a new place in the stacks. You can still find these materials in the library catalog, Ignacio, by doing a keyword search for “gleeson reference collection.” All physical reference items were given that tag before the move began. As for reference services and collection development policy going forward, a stronger emphasis will be placed on electronic resources. If you have any questions or need help finding something that used to be in the Reference Room, please contact us via Ask a Librarian. Jocelyn, a Reference student assistant, loads up a cart of books to be integrated into the main stacks. Student assistants have been a huge help with this project. Thank you! Thanks to everyone involved for what has been, and continues to be, a smooth project. The three departments have worked really well together and shown exemplary teamwork. Thanks again! On June 1, 2016 the library catalog and remote access to databases will be unavailable from 8:00 a.m. to 11:00 a.m while the system is migrated to a hosted environment at Innovative Interfaces Inc., the vendor of our library catalog and integrated online system. This move will benefit our library patrons in many ways, primarily offering a more stabilized operating environment. Celebrate the Bay Area’s Annual Bike to Work Day with I Bike to work at Gleeson Library, Thursday 5/12!! Finals are just around the corner, so what better way to relax than to go on a bike ride!! So for all those hard working folks studying for finals , Gleeson Library will be celebrating the Bay Area’s Bike to Work Day with I Bike to Work at Gleeson Library!! Bike to work at Gleeson Library and receive FREE library swag!! Say Hi to us over at the Access Services Desk and let us know that you Biked to Work at Gleeson Library. Also, be sure to look for the Gleeson Library Bike to Work Day library cart by the bike racks south of Gleeson from 9am-11am!! Bike to Work Day is part of National Bike Month, so Bike Hard and Be Safe!! !